We’ve been called to at least five homes in the past 60 days due to a rash of break-ins involving kicked-in doors. In fact, the homeowners involved in this particular break-in were referred to us by the same police officer we had met earlier in the day at another job we were quoting. 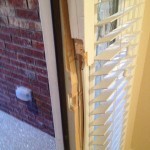 The homeowners called us to take a look at their damaged front entry door. Craig Rowe, our Installation Manager, immediately noted that the steel entry door was what is generally called a builder grade or construction grade product which is usually a low cost, average quality version of the product. Many times, builder grade products work fine for their purpose, but trusting your home security to a builder grade door is risky. Most of these doors are made from 26 gauge steel, while better steel entry doors are made from 20 or 22 gauge steel which is almost twice as thick as 26 gauge steel (the lower the gauge, the thicker the steel). Craig has learned that intruders kick the center of the door to cause the door to fold just slightly which enables them to more easily compromise the lock hardware. Thin metal doors, like the builder grade products on this home, easily fold after just one or two kicks. 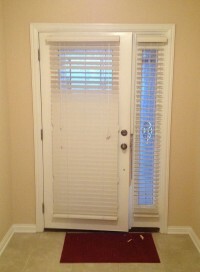 Thicker metal doors are designed to withstand much more force. In addition, quality lock hardware should include a steel strikeplate installed with at least 3″ long screws to prevent fracturing of the wood door frame. This home had low grade lock hardware that yielded easily to forced entry (notice splintering of wood in frame between the door and sidelite).